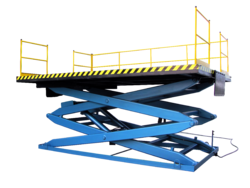 In order to meet the diverse requirements of our esteemed clients, we are manufacturing and supplying a comprehensive range of Scissor Lift Tables. 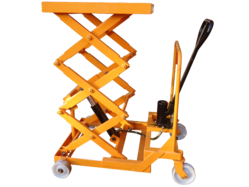 We have been counted amongst the most trusted names in this domain, engaged in providing standard quality range of Hydraulic Scissor Lift Table. The offered Hydraulic Scissor Lift Table is available in the market in various sizes and dimensions. 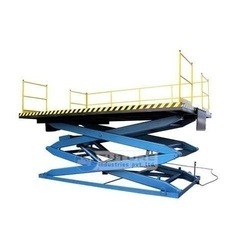 The Hydraulic Scissor Lift Table is extensively used to handle material that is not practical to move by hand. Our products are available in the market in bulk. Future industries offers a wide range of Hydraulic Scissor Lift Table in advanced features to cater to vast requirements of clients. The AHLT Lift Table provided by us is safe & efficient and ways to endless Material Handling Applications at Distribution Center, Logistics Companies, Industries etc. Our Lift Tables are popular in the market because we don’t compromise on the quality and always endeavour to meet International Standards by stringent quality checking and using State-of-the-art Technologies in the manufacturing process. In order to fulfill the ever changing demands of our clients, we are engaged in offering a quality range of Hydraulic Scissor Lift Table. These products are manufactured using precision techniques and are designed in accordance with the required industry standards. The offered range of products are also customised in order to meet the specific requirements of our client. We are offering to our clients, Hydraulic Scissor Lift Table, which are ideal for heavy duty application under the toughest working conditions. 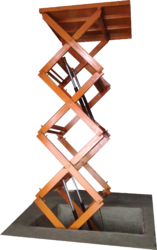 These have scissor leg rollers, entrapped within the structure of the platform and base frame to ensure maximum unit stability on all four sides. Four Scissor. Manual Hydraulic. Mobile Version. 2 Nos. Inclined Mounted Honed Hyd. Cylinder With Hard-Chrome Plated Piston Which Is Actuated By 1 No. “Dowty” Make Double Acting Hyd. Pump. Base & Top Table Structure Will Made From M.S. ‘C’ Channel Section. 2 Nos. Scissors Are Made From Heavy-Duty M.S. Box Section. Platform Is Covered By M.S. Sheet. 4 Nos. 300 X 75 Mm. Size C.I. Rubber Coated Wheels With 2 Nos. Bearings In Each Wheel. Front Two Wheels With Swivel Castor & Rear Two Wheels Are Fixed Mounted. 1 No. Inverted ‘T’ Shape Towable Type M.S. Pipe Handle For Push- Pull Purpose. One Coat Of Primer & Two Coats Of Auto-Finish Paint. We provide Scissor Lift Tables (Heavy Duty) to our clients that can be used for lifting light weight material and is sturdy in construction and reliable. Ideal for lifting various material to the desired height, these Scissor Lift Tables can be custom-made to suit the specific requirements of our valuable clients. Scissor Lift Table are used to raise and position workpieces for ergonomic access. They are used for material positioning, load positioning, or lifting in applications such as construction, automotive and garage service, electrical and power service, telecommunications, manufacturing, and inventory management. 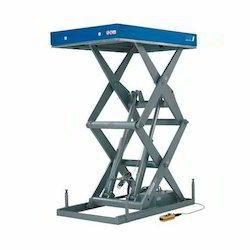 Lift tables are also used in the wire and cable industries and in other applications, such as painting, where access to above ground locations is required. Important specifications for lift tables include lift capacity, vertical lift travel, platform width, platform length, and actuation method. Lift capacity is the maximum force or load supported by the lift. Vertical lift travel describes the difference between fully lowered and fully raised lift positions. Platform width is the narrow dimension of the lift platform. Platform length is the long dimension of the lift platform. Lift tables may be actuated by hand cranks, screw drives, foot pumping and ratcheting, pneumatic air cylinders and air motors, hydraulic cylinders and motors, or electrical motors. Our clients can avail from us an exquisite range of Hydraulic Scissor Lift Table. These products are fabricated using premium grade material, which complies with all the quality standards of the industry. The offered range is available in varied specifications as per the clients requirement. These products are highly acclaimed for their excellent reliability, easy operations and longer service life features. Clients can avail these products as per their preference. 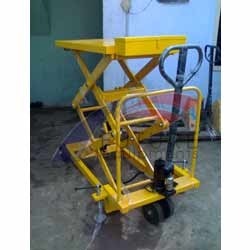 We are manufacturers, suppliers and exporters of various types of Movable Scissors Lifts Tables for hoisting and lifting operations for various heights and industry types. 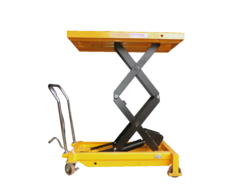 Hydraulic scissors lift tables manufactured by us are dependable, strongly built and entirely safe for any kind of lifting operation. Future industries dependable hydraulic scissors lift tables are made from the best steel with state-of-the-art expertise and machinery. The precision manufacturing process employed ensures that each of our scissors lift tables is up to international standards and specifications. Our hydraulic scissors lift tables come in a range of styles from common standard to customer-defined lifts. Our hydraulic scissors lift tables have different table sizes and weight loading capacities. Our scissors lift tables are known for their little or no maintenance costs and ease of handling. Understanding the requirements of the customers, we are engaged in manufacturing and supplying Hydraulic Scissor Lift Table. These Hydraulic Scissor Lift Table are manufactured by using superior quality material and following the guidelines of the industry. In addition to this, our experienced professionals monitors the production process at every stage. We also offer the products in customised range as per the requirements of the clients, so as to fulfil the needs in the best possible manner. 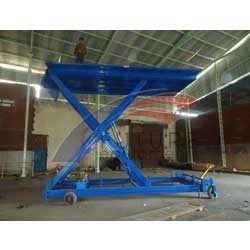 With our expertise in this domain, we are able to offer a superior quality range of Scissor Lifting Table. These products are manufactured by us using best quality mild steel, which are sourced from the most trusted vendors of the market to ensure their secureness, sturdiness and dependability. The offered can also be customised according to the requirement of the clients. Our range have different weight loading capacities and are available in different types. These are appreciated for their low maintenance costs and smooth & easy operational handling. We are one of the prominent manufacturer and supplier of an unbeatable range of Scissor Lifting Table. The offered range have the height of 2500 mm and have the capacity of 2500 kgs 2, 5 ton. 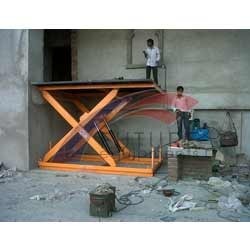 These tables are extensively used for loading and unloading of tools, dies and instruments. Owing to their features like robust structure, easy operation and high durability, the offered range of products are highly appreciated by the clients. Before the end delivery, these products are rigorously checked by our quality controllers for their best result.